The proposed community aquatic park for Paynesville has a likely site: the athletic field north of the student parking lot at Paynesville Area High School. 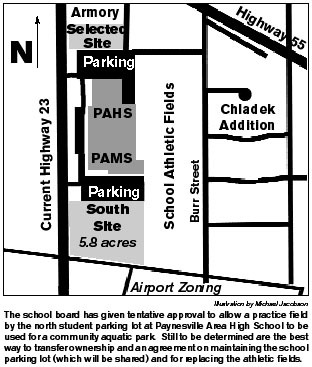 The Paynesville Area School Board gave conditional approval to allowing that site to be used last week, after hearing another plea from the ad hoc pool committee. The pool committee had first approached the school board about using a school site for the pool in December 2002. 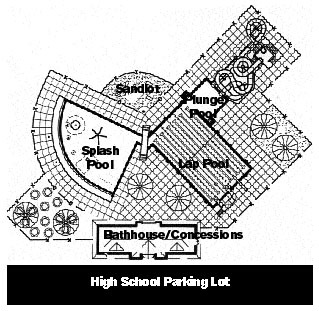 At that time, the pool committee had two pool sites on school property: one between the high school student parking lot and the armory and the other south of the middle school. Citing space concerns, in particularly due to the limitations put on the school property by the airport zoning, the school board tabled any action on this first proposal in January 2003. But with the pool feasibility report done and with the committee still believing the school sites offered the best visibility and the best complement to exisiting recreational facilities on the school grounds, a half dozen members of the ad hoc committee presented the feasibility study this summer to the Paynesville Township Board of Supervisors and to the Paynesville City Council, who both supported the school site. "We like to make one more appeal and ask for your consideration," said city administrator Steve Helget to the school board last week. Board chairman Pat Flanders, who is still very concerned about the loss of building rights for the school district due to the airport zoning and about the possible loss of land to an improved Highway 23, asked the committee about a third alternative: using school property on the end of Burr Street. Flanders thought this might be easier for the school district to allow to be used, as this property would be less likely as a school building site. This property is in Zone B of the airport zoning, noted Helget, which still limits it to 15 people per acre, not enough capacity for an aquatic park. Replacing an athletic field with a pool would still require the school district to build a new athletic field somewhere else, noted Kyle Nehowig, who served on the ad hoc pool committee and works as the athletics coordinator at school. Building on Burr Street would not have the visibility of the site between the school parking lot and the armory, and there is no parking lot to share with the school. Sharing the school parking lot might be advantageous to the school district, noted superintendent Howard Caldwell, if a maintenance agreement could be reached. The school parking lot and the school road by the softball fields already get a lot of nonschool traffic, while the school maintains these surfaces alone. Sharing a parking lot would seem to be ideal between the school district and an outdoor aquatic park, as the school uses the parking lot in the fall, winter, and spring, and the aquatic park would use it mainly in the summer. Board member Tami Stanger said having a pool next to the school would be ideal for running swimming lessons through Community Education. This year, she noted, over half her son's swimming class at Belgrade were Paynesville kids. Besides, the school could always construct another building in the middle school parking lot, she said, and build more parking lots in the area that is heavily restricted by the airport zoning. Another concern for the school district would be to get the land back if a pool does not end up getting built on that site. In 1993, the school district agreed to sell that same property to a community aquatic park initiative, which never was completed due to lack of funds. In the end, the school board tentatively agreed to allow the property between the high school student parking lot and the armory to be used for an aquatic park. First, though, the optimum method for transferring the property needs to be determined, with the school district contacting their lawyer. The school district also wants safeguards that if the project does not eventuate, the property will revert to the school district. Also, the school district wants to establish maintenance agreements for having the aquatic park at that site, including sharing the use of the high school parking lot and compensating the school district for constructing a new athletic field, most likely taking part of the ag fields. The next step for the ad hoc pool committee is to better define the costs for an aquatic park, which will be used in a public survey and at public meetings. If a facility is built, both the city and township intend to hold public referendums.